Greetings from the 15th Indigenous Environmental Network gathering to Protect Mother Earth in Newe Segobia (Western Shoshone territory)! The first panel of the day - about mining & the extractive industries - is about to get started, with amazing speakers from all over, INCLUDING KI!!! There are 2 smaller workshops on mining today & a field trip tomorrow to Barrick Gold's Cortez gold mine, which is threatening to expand into Horse Canyon, one of the most important Western Shoshone sacred sited. Thanks to the Dominion for editing & posting 'Gravel and Gold', a narrative article about a prison visit with Tyendinaga Mohawk spokesperson Shawn Brant, Barrick Gold's Pascua Lama project in Diaguita territory ('Chile'), and related issues. The longer (as in 16-page long) version (PRISON NOTES: They Came First For the Mohawk, and I Didn't Speak Up Because I Wasn't Mohawk...) is available on my other blog. 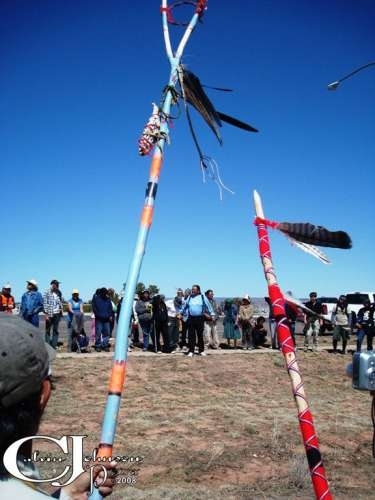 My most recent article, THE ROAD BEGINS AT THE BOTTOM OF YOUR FEET: The Longest Walk 2 Speaks Out for Mother Earth) is about the Longest Walk 2, the Dooda Desert Rock resistance and uranium mining in the Navajo Nation, the Y-12 National Security Complex & nuclear plant, and the bombing and mining of Western Shoshone territory. » continue reading "Sandra's new blog, Tyendinaga & the Longest Walk 2"